Crowdbotics publishes on Medium. Here are the reasons why. Marketers, are you wondering whether you should publish your company blog as a Medium publication? Medium has had its moments as a content platform for business and brands. It was greeted by marketers with skepticism, praised, over-praised, lambasted, and finally “abandoned”. Six years after launch, Medium has settled in as a mature product that can be evaluated more objectively, outside of the initial hype cycle. Medium has its pros and its cons as a blog platform for business. As Director of Product Marketing and Growth at Crowdbotics, I chose to adopt a Medium-first blog strategy for our company blog because of Medium’s benefits in content distribution and post engagement — as well as a few other factors I’ll go into below. If you see similarities in your business model, audience, or brand, Medium might be the right blog platform for your business. One of the biggest benefits of blogging on Medium versus other blog platforms is that Medium has a built-in distribution channel reaching 86M+ unique monthly visitors. In addition to creating high-quality content, it is a content marketer’s responsibility is to develop scalable distribution channels. Medium’s active daily audience is a sizable additional channel that you can use to distribute content. Medium’s readership skews towards certain categories: Technology, Design, Marketing Life Learning, Business, Entrepreneurship, Startups, Culture, Politics. Crowdbotics publishes a variety of technology, design, and programming-related content. Technical content is performing better and better on Medium, and this is an area where Crowdbotics will continue to direct time and resources. 8% of Medium’s referral traffic comes from GitHub. GitHub also accounts for 10% of Medium’s outgoing link traffic. Many of Medium’s other top referral sources are coming from sites focusing on technical and semi-technical content: Hacker News, Hacker Noon, Free Code, Twitch. As a marketer, you want to go to where your audience is, and Medium is a good choice for reaching technical and semi-technical audiences. Medium has a 93 Domain Authority (DA). DA is a 0–100 statistical measure of a website’s reputation. Domain Authority is a significant factor in how a website will rank in search engines. Because of Medium’s high Domain Authority, you have a higher likelihood of getting traffic to your content from Search. All things being equal, the same content has a higher likelihood of ranking on Medium than on your own domain that has a substantially lower domain authority — especially when you are just getting started. When you backlink from Medium to your primary domain, these high-DA links also add SEO value to your primary domain. As a product of Medium’s higher Domain Authority, you also have the ability to compete for more competitive keywords. Again, all things being equal (similar quality, traffic, shares, links, engagement) a post on Medium competing for a highly competitive keyword such as “token sale” will end up with a higher Search Engine Page Result (SERP) than the same post on a low-DA domain. A great post on Medium may earn a 1st page SERP for a relatively competitive keyword. The same post on lower-authority domain will probably get buried. Medium levels the playing field (a bit) for newer brands competing for higher-value keywords. Medium gives great content a chance to compete. Here is an example of a referral traffic for the post “How to write an API in 3 lines of code with Django REST framework“ after 3 days. It’s difficult to run a 1:1 experiment comparing speed of Search traction but, anecdotally, this is a very short time frame to see such traction from Google. The trend is similar on other Crowdbotics posts. Thanks to Medium’s Domain Authority, top performing posts make it to a high SERP faster than lower DA sites. Medium’s algorithm for post promotion elevates content that attracts the most engagement. This means that high-quality (especially “evergreen”) content will continue to perform well for the long-term. You always hope for viral traffic, but you cannot predict when a post, or how many posts will take off. That being said, there are ways to put yourself in a better position for viral traffic. If you publish quality content and share consistently, a small percentage of posts will likely perform very well for you. With a well run content strategy, one post in 10 may perform 10x better than all the others. Every few dozen posts, one may perform 100x better. This is not a power law you can apply to content in general but, if you consistently publish good content, and you have a legitimate message-market fit, you will see some consistency in performance peaks. Publishing on Medium maximizes your chances of moonshot virality because, as a publication, Medium is incentivized to surface the best performing content to readers again and again. If you make it to Medium’s front page, your post is going to do very well. It will enter a virtuous cycle of exposure and engagement. Being a top performing post for a keyword on Medium is like being a category bestseller for Amazon. It is advantageous for a publication to surface top performing content in a way that is different than search engines. Search engines optimize for relevancy. Publishers (and eCommerce) optimize for top performers. Followers of your Medium publication are automatically notified each time you publish. Email marketing has long been a reliable tool for notifying your broader audience of new content, but this channel is declining in effectiveness. Ask any marketer. Across industries, Opens and Click-Through-Rates of marketing emails are declining. With inbox tabs, most promotional emails are never seen by users. (Bounce Rates and Unsubscribe Rates remain relatively constant, obscuring the channel’s decline.) An email that never makes it to the primary inbox might as well have never been delivered. When a reader visits Medium, they are notified of your post in their alerts if they are subscribed to your publication. These notifications are nowhere near as powerful and versatile a promotional mechanism as marketing emails once were. However, the technology is changing and you cannot rely on what once worked. Medium notifications are a value-add, if only a minor one. Medium has generally higher engagement than other blog platforms. Medium allows social logins and maintains sessions with cookies. If a user regularly visits Medium, they are likely to already be signed in, making commenting simple and quick. This is not always the case with other blog platforms and commenting plugins. Medium also gives readers multiple ways to engage with content. If a story resonates with you, you can leave a Response for the author underneath the post just like the comments section on most blog platforms. You can Clap up to 50 times for post that you like. If you’re reading a story and find a passage you like, you can Highlight it. When your followers read the story, they will see your highlight, and your name will pop up above it. If you want to leave some feedback on an article in a private way, you can leave Note for the author. Notes can also be an interesting way to treat posts as a living document. It sometimes makes sense to edit and publish a post if you want to make changes, but authors can also leave treat Notes as ‘footnotes’ to add extra context after publication. The versatility of Medium’s commenting tools, as well as its relative ease-of-use, makes it as good a comment system available on any blog platform. Medium has an API for posting, but actively policies algorithmic and low-quality content. This cuts down on the platform’s overall signal-to-noise ratio. Your posts are not competing with bots or high volumes of low-quality content automatically created with article spinners. @ mentions make it easy for your content contributors to interact with other publications and authors. As an editor, I find it relatively easy to give feedback and communicate with our writers on Medium. Crowdbotics is a remote-first company. We have a core team of 25, about a half dozen of whom are regular blog contributors. We work with a 400-person community of domain-expert developers all over the world as well, many of whom are writing for Crowdbotics on interesting technical challenges they solve for clients. I also regularly work with 3rd parties on contributing content: freelancers, customers, business partners, investors, etc. With so many writers, each time-saving step ads up. Medium makes it convenient for multiple editors to review posts and leave comments in way that is similar to Google Docs. However, with Medium, you have the advantage of editing articles exactly as they will appear — formatting and all. You can also leave private Notes for authors after a post goes live, which comes in handy. If you host and maintain your own business blog, you have the ability (and responsibility) of optimizing for search from a technical perspective. For a sizable blog, this can be a full-time job (or multiple full-time jobs). When you publish on Medium, you must optimize posts from a content and keyword perspective, but you do not have to fuss with technical SEO considerations such as sitemaps, load time, CSS issues, browser and screen compatibility, 301 redirects, broken links and images, erroneous scripts, etc. With Medium, you have the ability to scale your business blog indefinitely without getting too technical. UI and UX are real problems for many blog platforms and themes. It seems like it should be simple, but there are plenty of business blogs out there that are just unpleasant to read. Weird layouts, ugly fonts, odd image styling, pop-ups, ads, email captures: they all add up to a cluttered and annoying reading experience. Maintaining a consistent design and pleasant user experience can require attention and technical know-how on other blog platforms. If nothing else, Medium’s minimal interface ensures a pleasant reading experience. Chrome or Firefox. Desktop or Mobile. Medium looks right on every device. Mobile optimization is a major factor in Google search rank. Google announced that they would begin to favor mobile-ready sites back in April 2015. The announcement was dubbed ‘Mobilegeddon’. The immediate impact of the change was not as severe as predicted. Google instead decided to slowly propagate the change, giving sites time to catch up. Three years after the announcement was made, there is no doubt that mobile matters. Optimizing for mobile can be tricky. With Medium, you don’t have to think about it. Your business blog is ready for every screen. Blog platforms such as Wordpress are notoriously sluggish. Medium is fast. Medium pages consistently load under two seconds. Page speed is also an important usability metric. Faster page speeds generally translates to more Time on Site and Pages Per Session. Medium has great desktop page speeds and pretty good mobile load times. It’s always going to be in the Medium’s interest to get page load time as low as possible. — What about publishing on your blog and posting or syndicating to Medium? By re-posting your content on Medium, you run the risk of being penalized by search engines for duplicate content. As mentioned above, Medium has higher domain authority than your site and search engines may favor that version of the content, even if your site’s publication date is earlier. Simply copy/pasting from your blog to Medium is not recommended. When you publish on your blog and syndicate to Medium using one of their syndication services, such as the Medium Wordpress plugin, Medium creates a canonical tag which points to your blog as the origin for the content. Doing so gives you some of the benefits of Medium as a distribution channel, crediting increased exposure to your domain. This is a viable option for incorporating Medium into an existing blog strategy. However, you should not divide your readership if you can avoid it. You want all your views, comments, and shares in the same place. One post with the combined readership of two separate posts is likely to perform better than twice as well because of how search engines treat individual post analytics, the network effect of social sharing, the snowball effect of reader comments, etc. It’s also less confusing for readers. If you insist on publishing on both blog platforms as a security measure, I would advocate publishing on Medium first, then re-publishing on your own domain and set the canonical tag back to Medium. This would be more of a safety measure than a channel strategy. If the unlikely happens, and Medium just disappears, you can make an easier shift back to your own domain. Unfortunately, Medium no longer offers a custom domain option. When you publish your content on Medium, and those posts generate backlinks, shares, comments, etc., you can’t leverage all that SEO power directly to elevate your own domain in search rankings. If people click on backlinks from those posts to your own domain, you will get an SEO benefit, but it’s not the same as if the original content were living on your domain. Not being able to brand your Medium publication with your own domain is the biggest reason not to use Medium. You are not totally giving up on ranking your domain, but you are not investing in it in a maximal way. Search engine optimization should be a primary consideration for pretty much every online business. At Crowdbotics, Medium blog posts are only one piece of the puzzle. Programmatically created “templated content” also plays a key role in our Search strategy. Medium becomes less influential than it once was? They start adding ads — perhaps for competing businesses — within your content? They tweak their algorithm, lessening your reach? These are legitimate questions. You are somewhat at the mercy of Medium when you publish on their platform. However, the same things are true of Google and other channels you rely heavily upon. Keep backups of your content (and potentially cross-post to your own blog), but you shouldn’t lose too much sleep over Medium changing their policies in a way that negatively affects you anymore than the other channels you game-plan for in your marketing strategy. The editor for Medium is more limited than a platform such as WordPress. Wordpress gives you the full range of HTML editing as well as the ability to add text editor plugins. You are limited in how you can custom-brand the reading experience visually with Medium. You are going to give up some visibility into where your traffic is coming from (unless you want to UTM everything you publish, which is possible, but quite cumbersome to implement and report on). Medium does provide the basics though, including views, read time, referral sources, views vs. reads, fan count, and more. In my opinion, Medium analytics leave much to be desired but they are good enough to get the job done, and also force simplicity into your blog reporting. Just because it’s possible to get fancy with your blog reporting, doesn’t mean you need to, or that it’s more effective at the end of the day. 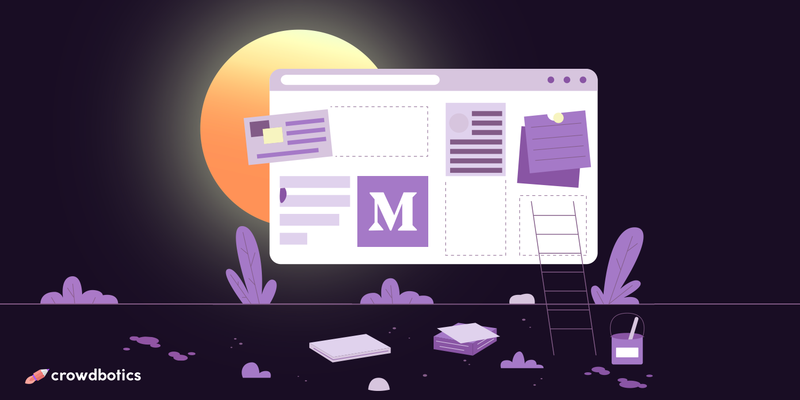 For all the reasons mentioned above, and more, Medium lends itself to Design, UX and Engineering focused business blogs, and makes it easier for a community of contributors to participate in content creation. If you’re evaluating a Medium-first blog strategy, review what other top organizations are doing on the platform. Take page out of their book. You don’t need to reinvent the wheel. Medium is not the right blog platform for every company. Like many business decisions, choosing a Medium-first blog strategy contains some calculated risk. But, along with this path are some reliable steps to success. At the end of the day, high-quality content wins, whether it’s on your own blog or on Medium. Pick your blog platform. Publish and promote regularly. Learn from your audience. Scale output accordingly. Medium is a blog platform well-suited for brand building. And, more often than not, the strongest brands win the category. Most business blogs take months (if not years) of consistent effort to gain traction and become successful. With a Medium-first blog strategy, you have an opportunity to reach a larger audience, get more engagement from that audience, and gain SEO traction for your posts quicker than you otherwise might. The big advantages of blogging on Medium for Crowdbotics are that our content has a greater opportunity to be seen by our audience, and it’s easier for us to engage both readers and contributors on Medium. For young companies in noisy industries, this can make all the difference. Are you publishing a company blog on Medium and have learned something not covered in this post? Let me know in the comments. I’d be interested to get your perspective. Have questions about evaluating a Medium as a blog platform for your business? I’d be happy to answer those in the comments if I can. Want to write for Crowdbotics? Send me an email at hello [at] crowdbotics [dot] com. Crowdbotics uses a combination of modular development, machine learning, and a network of expert engineers to help both technical and non-technical teams turn their ideas and specs into working software. Building A Web Or Mobile App? Crowdbotics is the fastest way to build, launch and scale an application. Developer? Try out the Crowdbotics App Builder to quickly scaffold and deploy apps with a variety of popular frameworks. Busy or non-technical? Join hundreds of happy teams building software with Crowdbotics PMs and expert developers. Scope timeline and cost with Crowdbotics Managed App Development for free. Director of Product Marketing & Growth @ Crowdbotics. More at williamwickey.com. The fastest way to build your next app.